SAN LUIS OBISPO — Cal Poly students are increasingly opting to study abroad, according to an annual statistical survey of U.S. campuses announced this week. The Institute of International Education, the leading not-for-profit educational and cultural exchange organization in the U.S., has conducted the Open Doors Report annual survey since 1919, and with support from the U.S. Department of State’s Bureau of Educational and Cultural Affairs since the early 1970s. Open Doors, which surveys about 2,000 U.S. universities and colleges with Study Abroad programs, released the 2018 figures Nov. 13. The organization estimates that about one in 10 U.S. students will study internationally during their undergraduate career. Cal Poly’s vision for internationalization is to provide foundational experiential learning, teaching, service and scholarship opportunities at home and abroad that will best equip graduates and the campus community at large to solve complex global challenges sustainably, ethically and inclusively. “Studying abroad provides rich opportunities for students to enhance their education and to prepare for work and life in a global society,” said Vanderkar. “Providing greater access to study abroad is a priority for the International Center. We promote ‘Learn by Going’ experiences with over 400 program options approved by the campus. Since 2000 Cal Poly has ranked as a top sender in the nation among master’s level universities for internationally bound students. In the 2018 survey (based on the 2016-17 academic year, the most current numbers available), Cal Poly sent 1,121 men and women abroad to 34 nations, an increase of nearly 21 percent over the 929 students who participated in the 2016-17 school year. Over the past five years, Cal Poly has seen participation in Study Abroad programs increase by nearly 46 percent, rising from 769 in the 2012-13 school year and more than 101 percent since the year 2000. In the past two decades, the university also has ranked in the top eight among those who study abroad both for long-term (an academic year) and short-term durations of up to three months. In the latest survey, Cal Poly was the top U.S. master’s university for yearlong programs with 78 students, a near 7 percent increase over the 2017 survey. Last year, the university was third in the nation with 73 students. Among mid-term duration stays of up to 20 weeks, Cal Poly moved up to second, from third, in the nation with 604 students, a rise of more than 32 percent from the 457 students listed in the 2017 survey. Students who studied abroad for eight or fewer weeks, inched up one spot to 14th with 461 students, nearly 21 percent higher than the 412 students in the 2017 survey. The U.S. Department of State’s Bureau of Educational and Cultural Affairs and IIE released new findings from the Open Doors Report on International Educational Exchange at a Nov. 13 briefing in Washington, D.C. The briefing was held in conjunction with the worldwide observance of International Education Week. Open Doors is published by the Institute of International Education, which has conducted an annual statistical survey on international students in the United States since its founding in 1919 and in partnership with the U.S. Department of State's Bureau of Educational and Cultural Affairs since 1972. Open Doors also reports on the number of international scholars at U.S. universities and international students enrolled in pre-academic Intensive English Programs. Further details on the Open Doors 2018 surveys and their findings are on the Open Doors website. IIE works to build more peaceful and equitable societies by advancing scholarship, building economies and promoting access to opportunity. As a not-for-profit with 18 offices and affiliates worldwide, IIE collaborates with a range of corporate, government and foundation partners across the globe to design and manage scholarship, study abroad, workforce training and leadership development programs. Find out more online. The Bureau of Educational and Cultural Affairs builds relations between the people of the U.S. and the people of other countries through academic, cultural, sports, professional and private exchanges, as well as public-private partnerships and mentoring programs. These exchange programs improve foreign relations and strengthen U.S. national security, support U.S. international leadership, and provide a broad range of domestic benefits by helping break down barriers that often divide us. ECA sponsors the flagship Fulbright Program, the Benjamin A. Gilman Scholarships for U.S. undergraduates with financial need, the Critical Language Scholarship Program in support of U.S. foreign language study abroad, and the EducationUSA network of more than 400 advising centers worldwide. Find out more online. 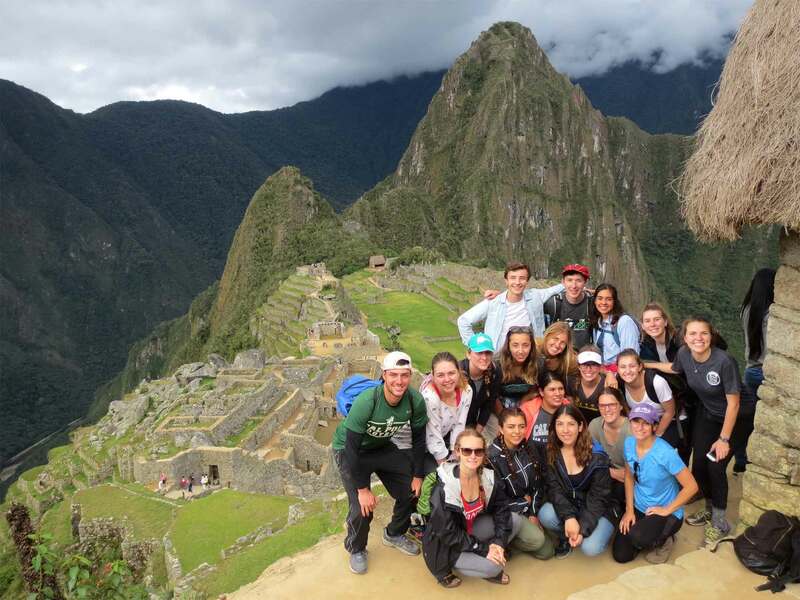 Photo information Cal Poly students visit the Incan ruins at Machu Picchu, which dates to the 15th century, during a Study Abroad session in Peru.